All forms of media can be integrated into a CD-Rom presentation, from text to video to animation. We can create dynamic and exciting CD ROM content to distinguish your company from the rest. 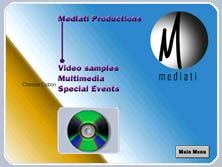 With in house programmers and multimedia suites, Mediati can provide all the necessary facilities to create your CD ROM.